Work to integrate the historic Tanjong Pagar Railway Station with the Circle Line Extension will start in the fourth quarter of this year. The Land Transport Authority (LTA) yesterday called a tender for contractors to dismantle, repair and reinstate the former station's train platform canopy structures. The 84-year-old building will be linked to the Circle Line Extension's Cantonment MRT station when it is completed in 2025. The canopy structures, which will be fully reinstated after the completion of Cantonment MRT station, are a vital part of Tanjong Pagar station. The LTA said the decision to reinstate the canopy structures was taken after consultations with members of the heritage community, as well as detailed studies conducted with an architectural conservation specialist. As Cantonment MRT station will be built under the platform area of the former railway station, about 290m of each old platform will be dismantled to facilitate construction works. The first 80m of each platform extending from the railway station building will be unaffected and protected throughout the construction work. The appointed contractor will dismantle the canopy structures - comprising the roof, beams and columns - and store them at a nearby restoration yard. It will then repair and restore the structures, and reinstate them with the reconstructed platform slabs in 2025. In a joint statement, the Urban Redevelopment Authority said the Tanjong Pagar station will be used as a multifunctional community building for 20 years after the new MRT station is completed. After that, the building will be part of the Greater Southern Waterfront - a development three times the size of Marina Bay. Construction of this sprawling precinct will start after the port is relocated to Tuas by 2030. Cantonment MRT station will have an exit next to the main hall, giving commuters "seamless access" to and from the heritage building. 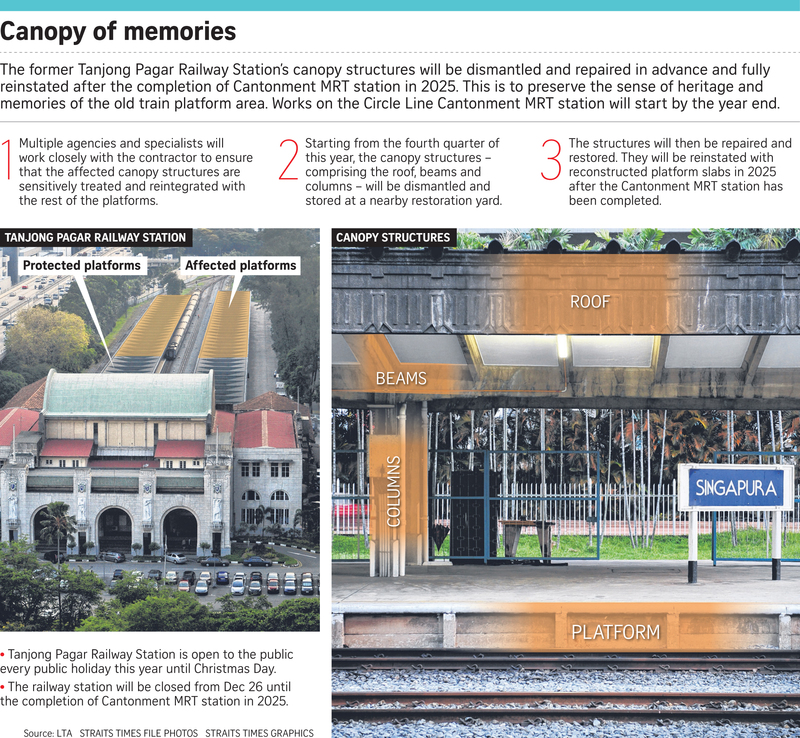 Tanjong Pagar station will remain open to the public until Dec 25. To facilitate the advance works and subsequent MRT station construction, the railway station will be closed from Dec 26 until the completion of Cantonment MRT station in 2025. Maintenance and stabilisation works will be carried out on the railway station building and mitigation measures put in place to protect it during construction works. The Circle Line Extension, with three stations, will close the loop for the Circle Line by connecting HarbourFront and Marina Bay stations. Commuters will have improved east-west accessibility when it is ready. Today, someone travelling from Marina Bay to HarbourFront, for instance, must make a circuitous journey which involves changing lines.